TOKYO, Oct 19, 2018 - (JCN Newswire) - TOYOTA GAZOO Racing World Rally Team will defend its leadership of the FIA World Rally Championship manufacturers' standings on the penultimate round of the season in Spain (October 25-28). 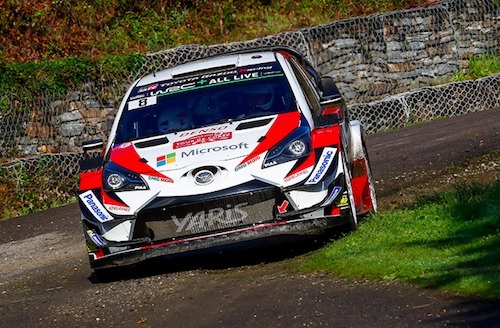 As the only truly mixed-surface event on the calendar, it will provide a thorough test for the performance of the Toyota Yaris WRC, driven by Jari-Matti Latvala, Ott Tanak and Esapekka Lappi. Based in Salou on the Costa Daurada to the south of Barcelona, Rally de Espana features one day of medium-speed gravel stages followed by two days on smooth, high-speed asphalt roads that are likened to racing circuits. At the end of Friday, teams convert their cars from gravel to asphalt specification in an extended evening service, and drivers need to quickly adjust to the change of surface the following morning. This year, there is a return to Barcelona for a street stage in the Montjuic area to get the rally underway on Thursday evening. Friday consists of three stages each run twice, mostly on gravel but with some asphalt sections in the 38.85-kilometre La Fatarella-Vilalba test. Saturday has two loops of three asphalt stages, followed by a short stage in Salou itself. On Sunday the Riudecanyes and Santa Marina stages are run twice, separated by service, with the second pass of Santa Marina as the rally-ending Power Stage. "I believe that Spain should be a good event for us. We have made some changes to help our car perform well on loose gravel, and we know that our car has already been strong on asphalt. Of course, there are always things to improve and we have been working on both surfaces in our pre-event testing. The Friday will be very important, particularly given our road positions, to ensure we are in a good situation for the rest of the rally. I think the last two rounds will be exciting to follow, both for the manufacturers' championship and in the drivers' title fight: Ott will be pushing to the maximum and I am sure his rivals will be too." "I am really excited about Spain and the chance to score a great result to help our bid for the manufacturers' championship. It is a rally I have always enjoyed: the asphalt stages there are particularly nice to drive. In my pre-event test last week I was fortunate to experience both damp and dry conditions, and I have a good feeling with the car. Personally I am on a nice run at the moment and the goal is to keep this going until the end of the season." "I am looking forward to driving again in Spain. We still have a chance in the drivers' championship and we are not going to give up. In a way it is more straightforward for us: we just have to win the last two rallies and see what happens. I can be confident about our performance on both gravel and asphalt, as we have been strong on both surfaces recently. Still, we are always trying to improve and we had a good pre-event test where we were able to work on some things to make everything as good as possible before the rally." "I am fully committed to helping the team fight for the manufacturers' title over the final two events of the season. As a team we have had some really nice results recently and I hope to continue that in Spain. I like the challenge of the two surfaces: as a driver you do need to adapt to the chance but I think we all get used to it pretty quickly. The asphalt stages in Spain are very special and I really enjoy driving them. Unfortunately I made a mistake last year but hopefully I can use that experience this time to have a strong finish."